If you’re looking for a romantic dinner experience, look no further than the Shoreline Restaurant in Gills Rock. 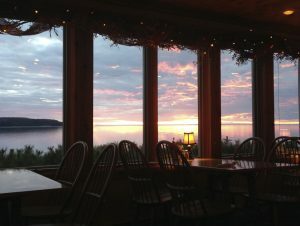 This local favorite has become a Door County must and one of the best places on the peninsula to enjoy fine dining with a view. The Shoreline serves up delicious cuisine and delectable experiences April through mid-November, so discover why you must add this restaurant to your list before they close for the winter! Mike and Mary Mead took over The Shoreline Restaurant in 1990. Since then, they have turned it into one of Door County’s most beloved eateries. They are warm hosts and welcome every guest into their restaurant with unsurpassed hospitality that the peninsula is known for. Their menu boasts valued family recipes, daily features, and more Door County selections that will leave you hungry for more! During your meal, you will be greeted with stunning views of western Green Bay. No matter which table you are seated at, the large glass windows will allow you to enjoy the scenery. We highly recommend visiting the restaurant for dinner right before sunset. Watching the sun dip its toes behind the horizon, leaving a brightly painted sky is the perfect compliment to a romantic evening together. The restaurant offers a lunch, dinner, and drinks menu. No matter what time you visit, you are sure to find a tasty dish that will send your taste buds on a delicious journey. Smoked Whitefish Wrap: You will love the traditional Gills Rock whitefish smoked to perfect and then served in a spinach tortilla with cream cheese, chives, dill, sweet red pepper, and green onion. Crab Melt: Imitation crab meat is piled on a grilled English muffin and served with tomato, swiss cheese, and guacamole. California Dreamin: A juicy burger topped with the regular condiments and thousand island dressing on a toasted bun. Whitefish on the Rock: A whitefish fillet is broiled and then topped with sour cream, cheddar cheese sauce, a touch of cayenne pepper, and lemon juice. Michael’s Veggie Lasagna (Served on Saturdays): This masterpiece consists of zucchini, squash, bell peppers, baby spinach, and other tasty veggies. It is then layered with mozzarella, ricotta, parmesan, romano, and zesty tomato sauce. Sauteed Five Berry Salmon: A pan roasted salmon filet is topped with unbelievably succulent butter made from raspberries, blueberries, cranberries, cherries, and strawberries. This drinks menu is made up mostly of Shoreline’s wide variety of wines, some crafted right in Door County! From merlots, sparkling wines, roses, or zinfandels, your options for finding your perfect glass of wine are nearly endless. The menu also offers many locally-made and domestic beers for you to taste and enjoy. Who says your romantic date has to end after your meal at the Shoreline Restaurant? Return to The Ashbrooke to enjoy even more quality time together. Take a dip in our indoor jacuzzi, cuddle around the fire table, or take a stroll through our beautiful grounds. Our luxurious rooms and suites also provide the ultimate privacy and luxury, so you and your sweetheart can enjoy a lazy evening together in the comfort of your own room. If you’re ready for the romantic getaway of a lifetime, contact us or take a look at our Free Vacation Guide. We look forward to hosting you!